Look at that haul! Right from our very own strawberry patch! Mark managed to keep the squirrels at bay with some netting, leaving these beauties untouched. Perfection. The sweetest strawberries I've ever tasted. 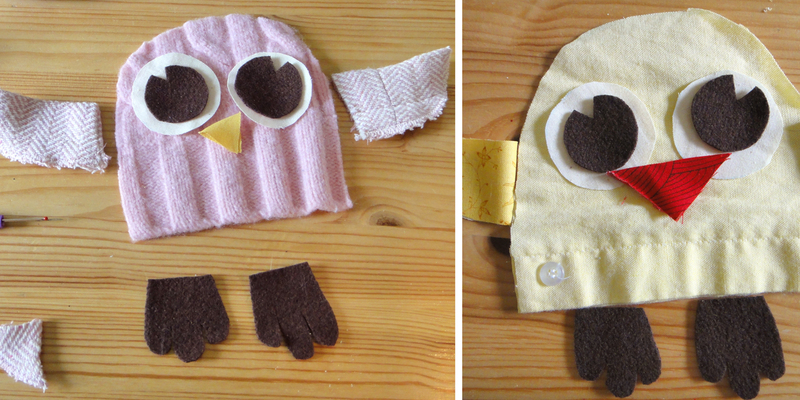 I made a bunch of these scrappy owlets for all the wee (and not-so-wee!) kids at this weekend's family reunion. I wasn't sure if the kids would like them, but they seemed to be a big hit! 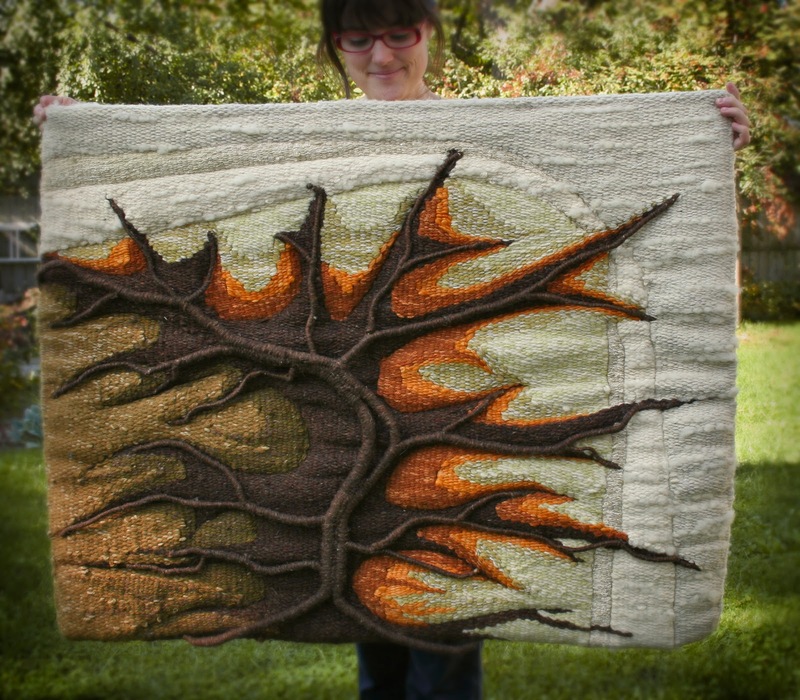 Crafting can be a very consumptive activity, requiring many new materials whose life cycles—as materials and then products—are not exactly environmentally friendly. 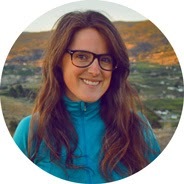 Yet crafting—by nature—is very clever and creative, so I'm very interested in trying to avoid introducing new materials into the product cycle, and using what already exists. The most perfect art supplies are those which are found: salvaged from nature (you can't get friendlier than blueberry ink, painted with a twig on birch bark peelings! ), or from the street, and saved from landfill. (Added bonus: free!) Now I should clarify that I'm no saint, and love a nice, glossy oil painting with a thick epoxy finish on a pristine cradle board, but this is just something that I've been thinking about, and would like to be more mindful about when starting a new project. 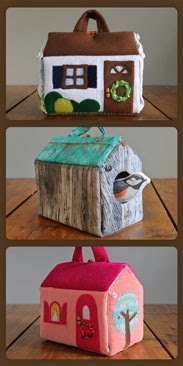 For these owls, I used mostly upcycled materials, with some new fabric (scraps) that I had from previous projects. Old felted sweaters, corduroy pants, and previously unfashionable shirts mixed with some cute cotton prints. Individually they didn't take too long to make, but the full dozen did take a few sessions spread out over a couple of weeks. I assembly-lined what I could, to minimize having to change thread colours back and forth. No real pattern to speak of; just sort of wung (?) it, basing the look on the many owl stuffies around the interwebs. (Seems like we're in a bit of an awesome owl craze right now!) I used a spool of thread to trace the shape of the pupils, and searched around my house for another circle that was a little bit bigger (could have just gotten the compass and traced out a template, but, you know) and found that the cap on my pepper grinder was the perfect size. A splashing good time (left). And (on the right) me in the process of being dunked. Plug your nose! Here comes the chlorine! I signed up to play innertube waterpolo without much thought as to how little I actually knew of the sport. But my friend had asked if I wanted to play, and I just said yes without must hesitation. We showed up to our first game, jumped in the pool and said "ok, so how do we play this?" about two minutes before the game began. So with a quick crash course of the rules and meeting our fellow players, it was time to begin. The first game was a bit of a shock. Primarily because I didn't realize that it was legal to flip someone off of their tube to gain possession of the ball, so needless to say, I spent much of that first game under water, and then struggling to get back on the tube (surprisingly very tough!). And when I was above water, I had many facefuls of chlorinated water. Good times. But! Once I knew all of these things, it was game ON. Though flipping an opponent's tube is not the easiest task. It requires a delicate balance of force—enough to cause them to lose their balance, without destabilizing yourself. I was not always successful, and most of the time was quite ineffective, neither flipping, nor preventing them from passing, but it sure was fun to try. We were pretty lax on the rules, which made it that much more fun. Our teammates were all laid back and super nice, and though some opponents seemed pretty serious about things, most people would smile at least, as they flipped you off your tube. How serious can you be about a game you play on an innertube? Now that I've got a season under my belt, I can honestly say that innertube waterpolo was the most fun sport I've played, probably ever. I have never laughed so much while playing a sport before! The Sprummer season was short, and unfortunately the Summer season conflicts with Ultimate Frisbee, but I will most definitely be signing up again in the Fall. 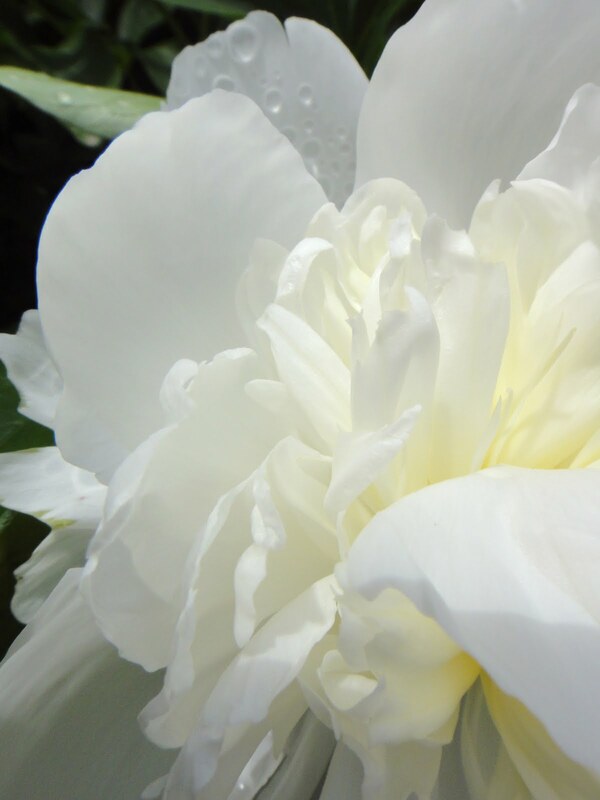 Vivacious, bold, dramatic, there is nothing quiet or understated about the peony. From their unburst globes urged open under trodding ant feet, through their spectacular pom-pom days, to the final throws of their explosive deaths, they are anything but subtle. 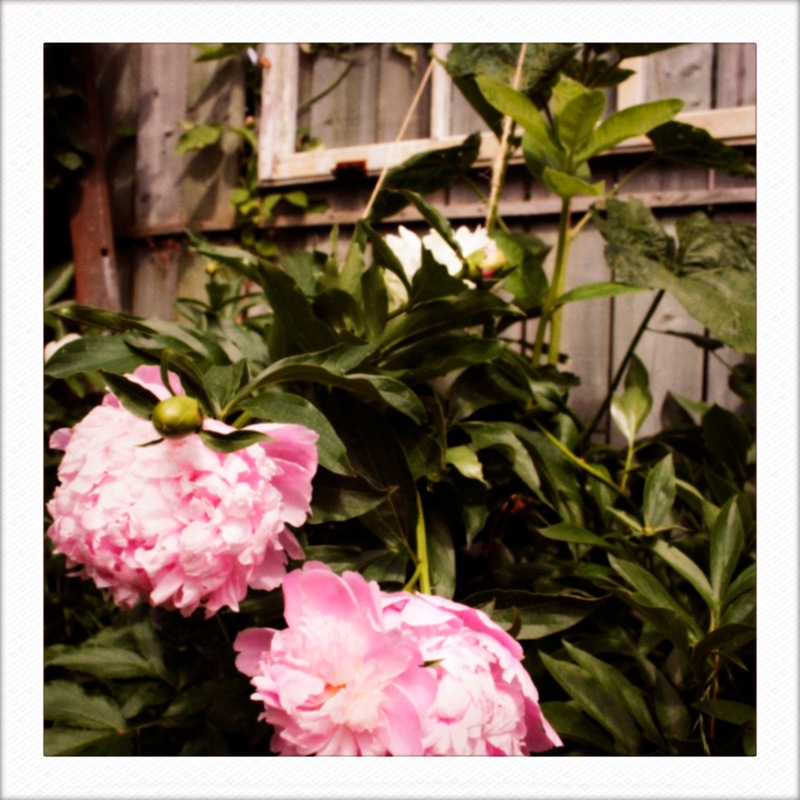 They droop heavily under the weight of their massive blooms, and make the other flowers look so meek. Festive and lively and frivolous, just because they can. I love those moments when you find something you lost, or you meet someone who knows a friend of yours, or knows where your tiny hometown is, or you smell a smell that reminds you strongly of a time when you were a kid — those moments when the world doesn't seem quite as big. A connection is made and you smile, because the sudden familiarity is so comforting. On Friday my coworkers and I took a jaunt at lunch to the neighbourhood curiosity shoppe, always full of treasures to delight in and marvel at. And I saw this vase, and immediately, it looked very, very familiar to me. Made of leather, with a flange at the back where it joined, the edge of which was burnished to a smooth shine. 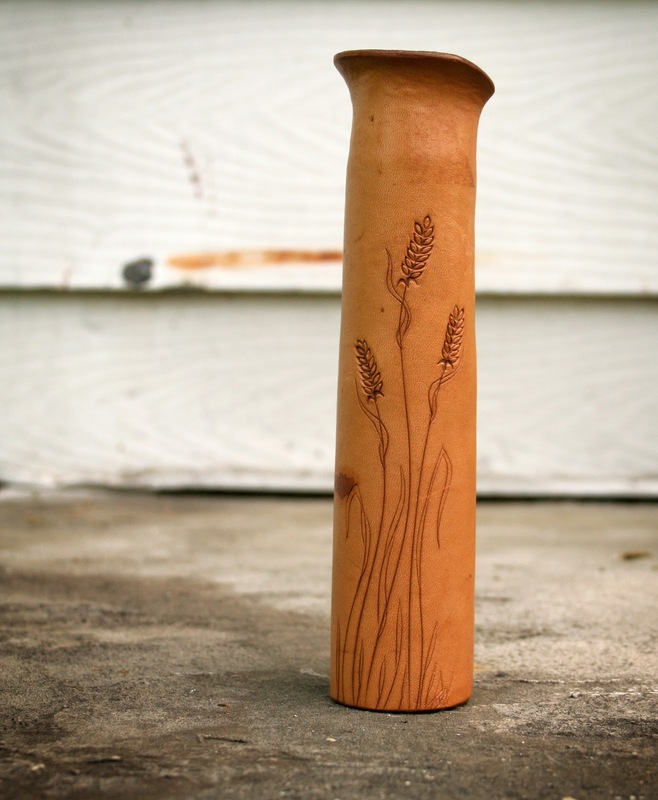 And a wheat design, stamped and carved into the front. I recognized the shape, tall and elegant and the way the opening folded out gently, and the wheat drawing. My dad made this. I knew it. I recognized these stamp shapes. He showed me how to use them and I played with them when I was young. There was no signature or mark to indicate the hand of the artist, but I knew. So I bought it (for a mere 5 bucks), and it was only later that afternoon, when I was inspecting it again that I saw the artist's initials carved discreetly in the wheat. PSW. My dad. This has happened once before. It was a hot summer afternoon in Toronto, and I was exploring Bayview Avenue with Mark and some friends, and we had come upon a store called The Elegant Garage Sale and my friend said "hey, check out this cool wallhanging," and I turned, and immediately said "wow, that looks like stuff my mom used to make." A shocked pause, mid-stride, as I looked again, scanning the details through my brain as the total familiarity registered. "This really looks like stuff my mom used to make." I picked up the lower left corner and turned it over to see if there was anything on the back. There was a tag, made of leather, with my mother's name and the title of the piece. Unbelievable! It was her artwork! After a few excited moments, I called her on the cell phone, and tell her what I'd found, and she said "I remember that piece, I was pregnant with you when I made it." So of course I bought it (for 25 bucks), and the ladies in the store were excited to hear my connection to it. 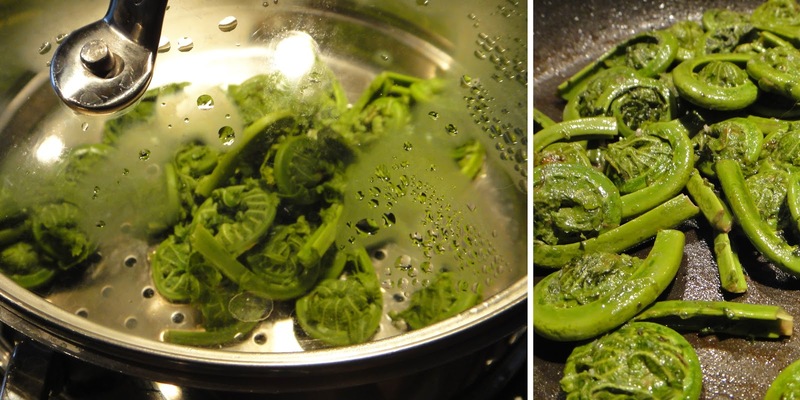 The ferns in our front garden unfurled so quickly this year, that we only had a chance to get two small fiddlehead harvests. And now, the timeliness of this post has quickly lost it's relevance, as all the delicacies and quiet hopefulness of young spring has been swallowed by and swirled into the frantic abyss that is summer. 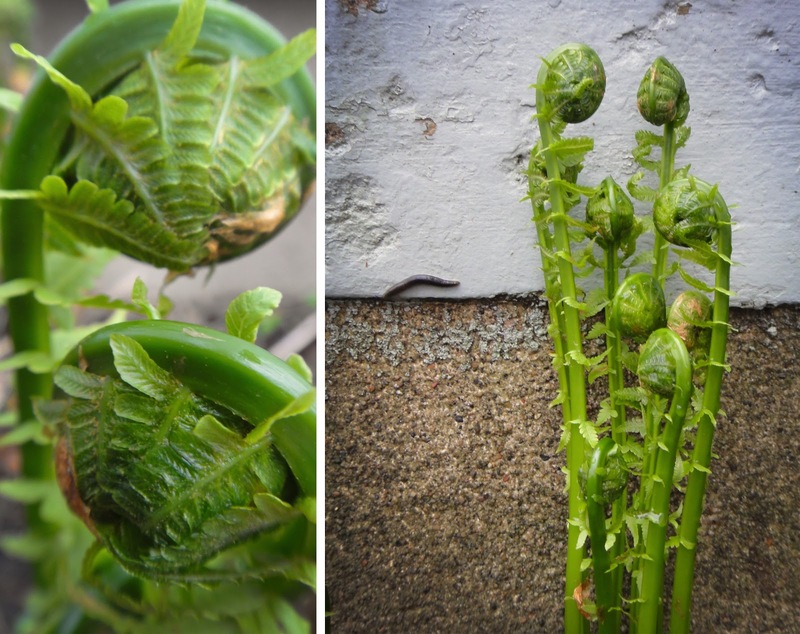 Not that I don't enjoy summer, it's just that I had hoped to be able to relax and languish in the hesitation of early spring that the fiddlehead itself seems to represent, but here we are. Fully unfurled. I read many, many articles and threads online to determine if our ferns were the edible kind, and how to prepare them, etc, etc. I had enough fear in me to do my research, just imagining the headline "Ottawa Woman Poisoned After Eating Own Ferns." (Somehow the more likely and mundane possibility like "Ottawa Woman Suffers Minor Stomach Upset After Eating Undercooked Fiddleheads" does not seem newsworthy in my over-active imagination.) But no suffering of any kind occurred, just pure gastronomical pleasure. And it was all the more enjoyable and gratifying knowing that I had cut it from my very own garden, just a few minutes before.